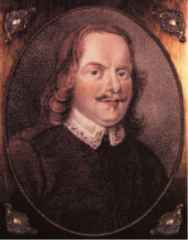 John Bunyan was born at Elstow, England, about a mile from Bedford in 1628. His father was a man of more intelligence than those who generally followed his calling, and he had John taught to read and write. When the little boy was ten years of age he first became conscious that he was very sinful. He speedily shook off these fears. He was “drawn out” in 1643, with others, at the siege of Leicester to perform sentinel’s duty before the city, when another member of his company expressed a desire to take his place; the request was granted, and that night Bunyan’s substitute was shot in the head and died. This deliverance produced a powerful impression upon Bunyan. His first permanent conviction of sin was produced by a sermon denouncing the violation of the Lord’s day by labor, sports, or otherwise. This came home to Bunyan with peculiar force, for his greatest enjoyment came from sports on the Lord’s day. A long while after this, Bunyan, in passing through the streets of Bedford, heard “three or four poor women,” sitting at a door, “talking about the new birth, the work of God in their hearts, and the way by which they were convinced of their miserable state by nature. They told how God had visited their souls with his love in Christ Jesus, and with what words and promises they had been refreshed, comforted, and supported against the temptations of the devil; moreover, they reasoned of the suggestions and temptations of Satan in particular.” From these women Bunyan learned to loathe sin and to hunger for the Saviour. He sought their company again and again, and he was strengthened to go to Jesus. One day, as he was passing into the field, he says, “This sentence fell upon my soul ‘Thy righteousness is in heaven.’ I also saw that it was not my good frame of heart that made my righteousness better, nor yet my bad frame that made my righteousness worse, for my righteousness was Jesus Christ himself, the same yesterday, to-day, and forever.” Then, as he says, “his chains fell off,” and he went home rejoicing. In 1655, Mr. Bunyan was immersed by the Rev. John Gifford, of Bedford. The same year he was called to preach the gospel. Bunyan was arrested Nov. 12, 1660., and he was in jail more than twelve years. His imprisonment was peculiarly trying. “the parting with my wife and poor children,” says Bunyan, “hath often been to me, in this place (the prison), like pulling the flesh from my bones.” And of his blind daughter he adds, “Poor child, what sorrow thou art like to have for thy portion in this world! Thou must be beaten, must beg, suffer hunger, cold, nakedness, and a thousand calamities, though I cannot now endure the wind should blow upon thee.” “The Pilgrim’s Progress” was written in Bedford jail. During Bunyan’s lifetime there were 100,000 copies of that book circulated in the British islands, besides which there were several editions in North America. And in the ten years which Bunyan lived, after his wonderful book was first issued, it was translated into French, Flemish, Dutch, Welsh, Gaelic, and Irish. Since Bunyan’s death it has been translated into Hebrew for Christian Jews in Jerusalem, and into Spanish, Portuguese Italian, Danish, German, Armenian, Burmese, Singhalese, Orissa, Hindostanee, Bengalee, Tamil, Maratthi, Canarese, Gujaratti, Malay, Arabic, Samoan, Tahitian, Pihuana, Bechuana, Malagasy, New Zealand, and Latin. This list of translations ends with 1847. Since that time it has been rendered into several additional tongues of our race. Nor will “The Pilgrim’s Progress” stop in its travels until it visits very land occupied by human beings, and tells its blessed story in the language of all nations. The pardon which secured Bunyan’s release from prison was ordered by the Privy Council, presided over by the king, May 17, 1672. After his liberation he became the most popular preacher in England; 3000 persons gathered to hear him in London before breakfast. Men of all ranks and of all grades of intelligence listened to his burning words, and heralded the fame of his eloquence to the kind. The learned Dr. John Owen told Charles II that he would relinquish all his learning for the tinker’s preaching abilities. While Bunyan was journeying upon an errand of mercy he was exposed to a heavy rain, which brought on a violent fever, from the effect of which he died in ten days, in London, Aug. 12, 1688. His last hours were full of peace. He was buried in Bunhill Fields Cemetery, where his monument is still seen. Bunyan’s church, now of the Congregational denomination, is still in Bedford. His chair is in the meeting-house, and some other relics of the immortal dreamer. A few years since the Duke of Bedford erected a handsome monument to Bunyan in Bedford, on which a statue of the great dreamer stands.